Main: english. 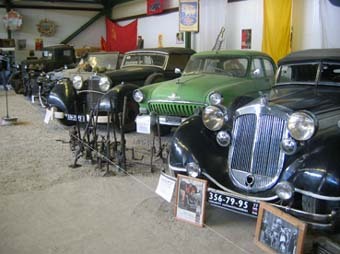 Lomakov auto-moto Museum. Дмитрий Ломаков и его музей старинных автомобилей и мотоциклов. "Lomakov`s oldtimers automobiles and motorcycles Museum"
We search partners for the sales of oldtimers cars and motor cycles to Russia. Welcome in our Museum! 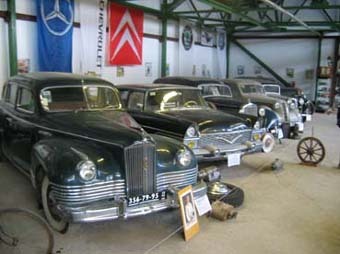 Visit and Excursion in "Lomakov`s old-timers automobiles and motorcycles museum"! Rent of antiquarian (old-timer) cars and motorcycles (for show, presentations, ornament of exhibitions, wedding, filming, photo and so on). 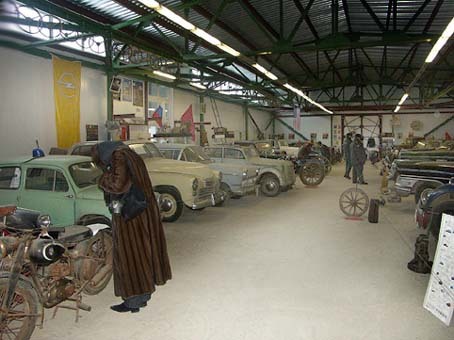 Help new project: "Museum "Allies on anti-Hitler coalition" in Moscow"
Collection "Lomakov`s old-timers cars and motorcycles Museum". If you have an opportunity and you want to help to a museum - place the address on a Museum and Club on your own page! address: Krasnodarskya, vladenie 58. Moscow, Russia, 109559. Since 1964, the Lomakov family has been collecting and restoring antique cars and motorcycles, but due to bureaucratic problems, the Museum of Antique Cars and Motorcycles was not opened until the late 1999. The museum's collection includes more than 120 antique cars and motorcycles. To support his museum, director Dmitry Lomakov rents his cars to Russian film studios and classic car transfert from Moscow hotel, and his restoration shop, and his consultation about classic cars, and sale spare parts for retro cars. All for museum. The most interesting exhibition pieces are 1949 Stalin's rare green ZIS-110 limousine ; 1954 Soviet gov. car ZiM (GAZ-12) ; 1977 Soviet gov. GAZ-13 "Chayka"; 1949 Soviet car GAZ-M20 "Pobeda"; 1960 and 1977 Soviet car GAZ-21 "Volga"; 1939 Soviet car GAZ M1; 1943 Soviet military car GAZ-67b; 1976 Soviet military car LuAZ-967 M; 1936 Soviet truck ZiS-5; 1933 Soviet truck GAZ-AA; 1960 Soviet car ZAZ-965 "Zaporojez"; 1951 Soviet car Moskvitch 400-420A; 1958 Moskvitch 407; 1961 Moskvitch 430; 1968 UAZ-69; 1943 military car Dodge WC-52; 1935 German Horh-853; 1935 rare Mercedes Benz 540 K; 1939 Mercedes Benz 320; 1938 Mercedes Benz 230; 1928 rare Opel P6; 1960 Opel Kapitan (GMC); 1933 rare BMW-303; 1939 BMW-321; 1956 Skoda 440; 1938 Shtyer-Daimler-Puch-50; 1942 Harley-Davidson WLA-42 military bike; 1947 Austria bike Puch 125 Duppelkolben; 1939 BMW R35; 1933 Soviet rare bike "Red Oktouber"; 1938 Soviet rare bike "Leningrad 8"; 1949 Soviet bike IZH-49; 1939 Soviet rare bike "TIZ AM 600" (+ sidecar); 1956 Soviet bike M1 "Moscow"; 1958 Soviet bike M-72 (+ sidecar); 1914 rare bike Peugeot and many more (50 classic cars and bikes in exposition hall). Nearest train (Moscow metro station): Lublino (400 metres).